A compact car returns to the Pontiac lineup with the G5 coupe derived the Chevrolet Cobalt coupe. All models feature a 155 hp, 2.2L 4-cylinder driving the front wheels. Base and GT models differ only in standard equipment. 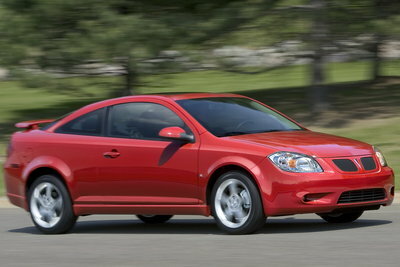 Anyone looking for more performance will need to go their Chevy dealer and opt for the Cobalt SS. Both models feature a standard 5-speed manual and optional 4-speed automatic transmission. An updated 2.2L four-cylinder with variable valve timing becomes the sole engine for the G5. The 2.4L engine has been dropped.